In Carol Holmes & Andrew Knight v HMRC  TC6824 the FTT allowed HMRC to access taxpayers' private bank statements. There was evidence that declared business income did not support private cash outgoings. The taxpayers disclosed income under self assessment was in respect of employment earnings, dividends and interest. They ommitted some interest and HMRC openned an enquiry into their returns. HMRC issued an Information Notice under schedule 36 FA2008 requesting details of all their private bank statements. HMRC had reason to believe that the taxpayer's tax returns may not show their total income. Evidence from third parties suggested their level of personal expenditure including the level of mortgage payments was not matched by their declared income. There were unexplained capital introductions made by the appellants into their company. The FTT decided that given the evidence of a disparity between the appellants’ declared income and their personal expenditure, HMRC had a legitimate reason to make further enquiries and the notices were upheld. HMRC had show that it had a genuine reason for requesting private records, and it was able to persuade the FTT that it had one. 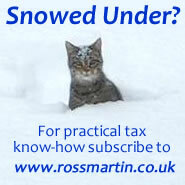 What may HMRC issue an information notice? Can you appeal? What records are covered? What penalties apply? Can HMRC contact third parties to access your data? Leading and recent cases on this evolving topic. When and how and what you can appeal.